This is another great recipe from Steven Raichlen's Planet Barbecue!. In particular this is dubbed "Bobby Flay's Cheyenne Burger." It sounded simple enough, but I was almost completely unprepared for exactly how delicious this was going to be--especially when you consider that this is a turkey burger recipe. Perhaps I shouldn't have been surprised. When you start with big ol strips of lovely bacon, you're going to win. Am I right? I tried Wright Brand Bacon for the first time. This was apple smoked, thick cut and very, very tasty--even by bacon standards. The part of this recipe that really piqued my attention wast the homemade onion rings to serve on top of the burger. I'd never tried this before. The instructions in the book were not all that specific so I winged it a little. It did specify heating peanut oil to 360f in a heavy pot. I used my cast iron Dutch oven. It also said you dredge the cut onions through flour seasoned with pepper, salt and cayenne pepper (amounts were not specified). Then you dunk the rings in salt and pepper seasoned buttermilk. Lastly before dropping them in the oil you dredge them back through the flour. I had ambitions of making up a whole mess of onion rings, but it all got really messy, goopy and frustrating after a while. I had some lovely specimens and decided that about a dozen or so were plenty for our burgers. As the burgers cooked, I brushed the buns with olive oil and gave 'em a quick toast. So to bring it all together, you slap cheddar on the turkey burgers as they come to 165f. Then you set them on the bun in a little puddle of BBQ sauce (I used Stubb's Spicy). 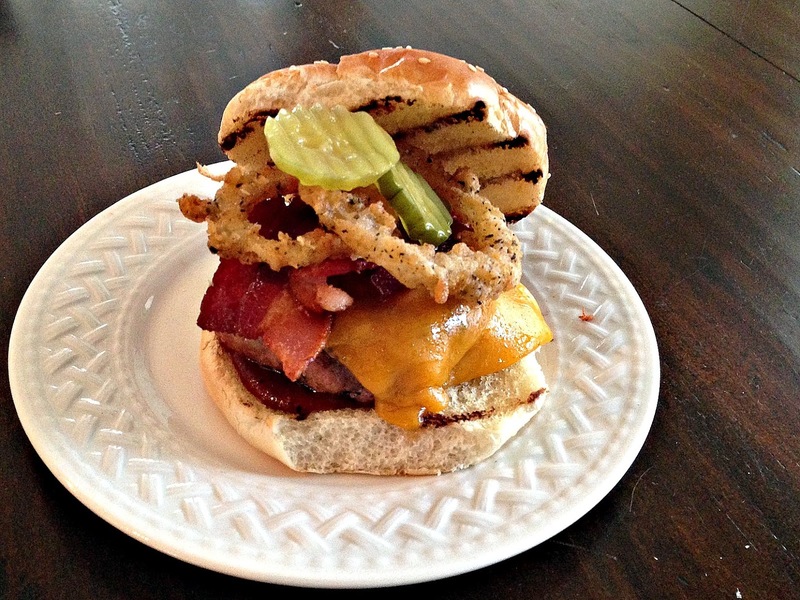 Top them with bacon, onion rings and pickle chips and you're ready to eat a real treat. I set up the photo of the burger shown at the top of the page. My four-year-old was licking his lips and called dibs on that one. He's not always the biggest eater in the world, but he put away nearly the whole thing. My six-year-old DID eat the whole thing and made quite a fuss over its deliciousness. I love this shot. My daughter is happy and my son is ripping at the bacon like a feral dog. This was easy and really darned good. Thanks for reading.